Aliquando’s Concert of Many Colours was an occasion to remember with delight – not only for the clever and tasteful use of colour in both song titles and dress wear, but for the individual and collective performances of the choir, soloists and especially pianist Anita D’Attellis , whose precise yet wonderfully flamboyant rendition of Gershwin’s ‘Rhapsody in Blue’ brought her a standing ovation so well deserved. 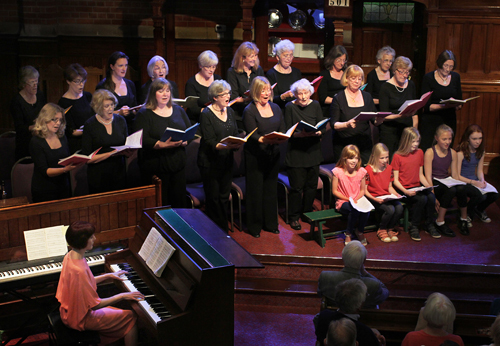 She was also accompanist for the choir and conducted them in the beautiful ‘Blue Bird’! The songs chosen gave the hidden talent within the choir an opportunity to show itself in songs such as, Sting’s ‘Fields of Gold’ with Sharon Pilgrim-Morris taking the lead, Blue Moon with Dan Evans, and an Elvis song ‘Blue Suede Shoes‘ sung by David Banbury which nearly brought the house down! 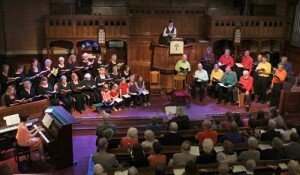 After a convivial interval with wine, coffee, beer and canapes on hand, the audience retired once more to hear a concert version of Andrew Lloyd Webber and Tim Rice’s every ‘green’ (you will notice the use of colour at every opportunity) ‘Joseph and the Amazing Technicolor Dreamcoat. 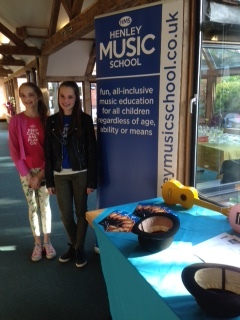 The concert was supporting the Henley Music School, the fun all-inclusive music education for children regardless of age, ability or means.